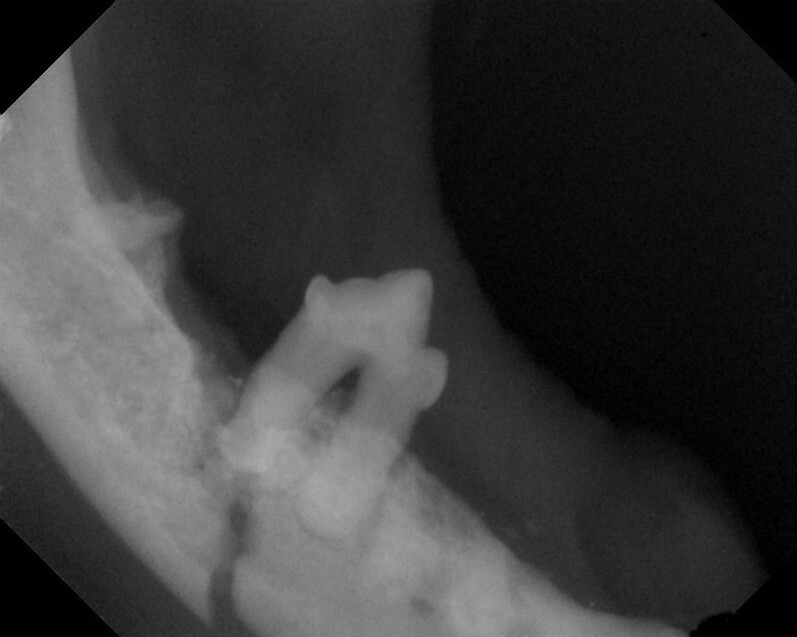 Mandibular and maxillary fractures in pets can occur for a variety of reasons. The most common cause is trauma. Fractures secondary to periodontal disease, oral cancer, and endocrine disorders are also possible. Finally, iatrogenic fractures which occur during tooth extraction or cancer surgery can occasionally occur. Full assessment of the jaw fracture may include detailed examination under anesthesia, dental x-rays, skull x-rays, or computed tomography (CT). There are a variety of techniques to repair jaw fractures including orthopedic wire placement, intraoral composite (acrylic) splints, bonding of the canine teeth, bone plates, titanium mesh, soft muzzles, and external fixation pins. Ultimately, whichever treatment option(s) is elected, the objectives of oral fracture repair are to stabilize the fracture, maintain normal bite, preserve healthy teeth and tissue, and allow the mouth to heal quickly. A mandibular fracture is seen on the x-ray above.